Although Tami felt like she was far away on vacation this past weekend, she was actually in Beverly Hills (which is approximately ten minutes from her home in Brentwood, California) celebrating her friend Arin’s 30th birthday with a little “staycation”. Arin loves brunch! A delicious assortment of omelettes and mimosas were had at a lovely French restaurant, Bouchon Bistro in Beverly Hills. Arin loves cake! White cake with white frosting to be exact. The girls gathered together to sing “Happy Birthday” to Arin and enjoy a slice of frosting (I mean cake). You only turn 30 once! Arin loves crossing things off her bucket list! A quick trip to LACMA called for a photo shoot in this beautiful lamppost installation. This is something Arin has always wanted to do. Arin loves “girl time”! On the way back from LACMA we picked up paninis from one of Arin’s favorite spots, Il Tramezzino, and headed to our final destination. You cannot go wrong with a sleepover at the Montage Beverly Hills, pink champagne, and a good old game of Cards Against Humanity. Arin loves giving presents! This time we were the ones who got to give. Tami cannot take credit for wrapping this adorable gift or making the card, however adding a few embellishments (such as black rhinestones and the birthday girl’s initial) goes a long way. You don’t have to go away to truly feel like you are on vacation. This past weekend ended up being just what the doctor ordered for Arin and her friends. A little staycation in Beverly Hills made even these LA natives feel like guests in their own city. Tami is so happy to have been able to celebrate Arin’s 30th birthday with her and hopes to spend many more in the future! This month’s Craft Club meeting was super impromptu. Our friend, Hannah, sent us an email at the last minute expressing her desire to craft. Unfortunately (as it was so last minute) none of the other girls were able to join, but we do love to craft and always want to help a sister out … so that is exactly what we did. Lauren graciously opened her home and set up her table for us girls to get our craft on. Let’s be honest … This month’s Craft Club meeting was really just an excuse to eat, catch up with our friend Hannah, and eat some more. Scott made us pizzas, and we devoured them … we even forgot to take pictures! Surprisingly, with all of the eating and chatting, we did actually craft a bit. Hannah used torn vintage wrapping paper and Mod Podge to begin to create initials for her own craft room. We can’t wait to see them finished and on display in her home! If you recall, Tami began working on this project last month … and conveniently picked it back up for last night’s meeting. These additions to her DIY gallery wall (coming soon) are still a work in progress, but making great strides. Lauren took on the biggest project of all … a baby book for her daughter, Ava. Of course, these things take time and Lauren did not expect to get too much accomplished last night, but she has now discovered why so many children do not have a baby book at all. Figuring out where to start is hard. Choosing which pictures to use is even harder (even with the help of the new app Lauren downloaded, Groove Book … which she is loving by the way!). Scrapbooking is a tedious job, but Lauren is determined for Ava to have a baby book … at least by the time she graduates high school! As always, we truly enjoyed this month’s Craft Club meeting. For a last minute planned event it went as well as ever. We look forward to meeting up with “the girls” next month and creating something new while inspiring each other along the way. This month, we hope we have inspired you to create something fun for your home or to get back on the scrapbooking wagon (even if it is a bit impromptu). Keep on crafting! As we mentioned in our last post (Under Construction: Modern Dream Kitchen), Robyn and Joel have decided to go with Leicht cabinetry for their kitchen, and we are so excited to be working with this company. 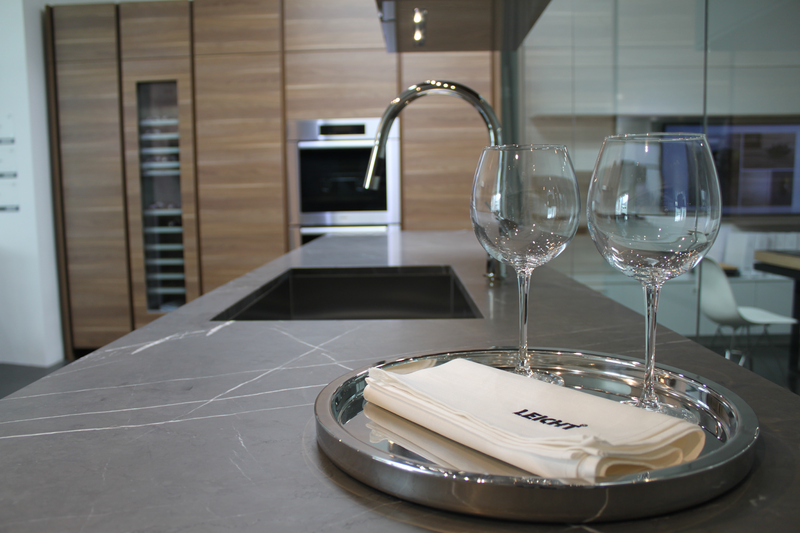 Leicht has just opened a brand new showroom in West Hollywood, and they would love to introduce their product to you. 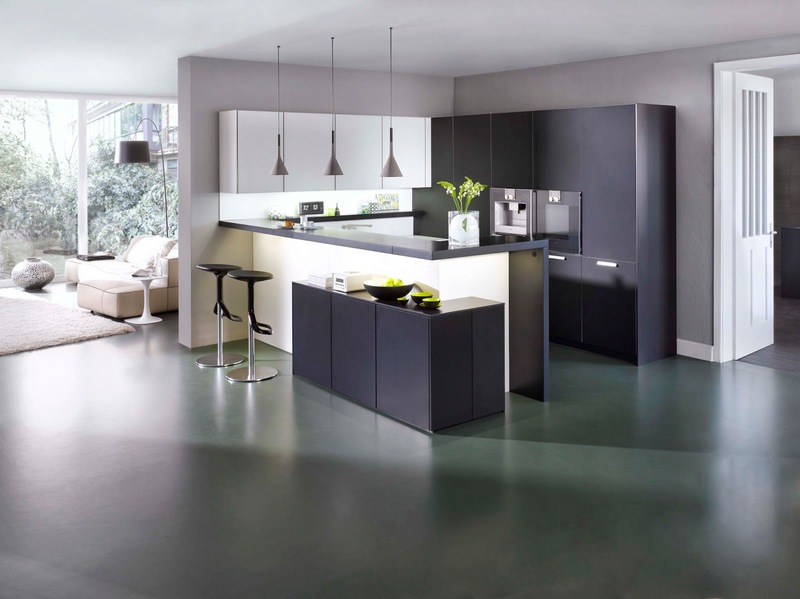 They are a German line of modular cabinetry with over 80 years of history. They have a large selection of finishes available and can easily customize their systems to meet your needs. The girls at the new store on Beverly Boulevard have put together some photos of their showroom and projects for us to share on our blog today, and we know you will love them. This company has really taken modern design to the next level. While customizing your cabinetry, you have options to include mechanical opening hardware for upper cabinetry, integrated panels for appliances, inner drawer lighting, back splash accessories for knives and other kitchen tools, pull out pantry shelves, and even various types of inner drawer organization (just to name a few). We, along with Robyn and Joel, have met with the company to complete the layout and design of their kitchen. We have seen the completed floor plans and 3-D drawings they have prepared and truly can’t wait to see it come to life. 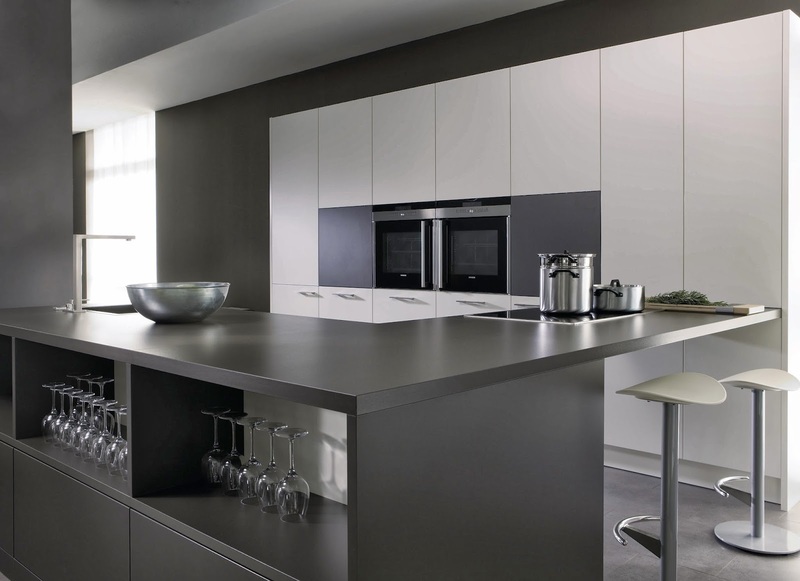 If your kitchen is in need of a makeover, feel free to contact us or Leicht for more information. Lauren’s in-laws recently purchased a new home, a major fixer upper. While they contemplated the decision to take on a project of this caliber and the many headaches it inevitably would cause (especially considering they are living in the house during construction), they also could foresee its potential and were excited to create their dream home. As all of their children have been out of the nest for some time, they now have the opportunity to create a space that is just for them … a place to relax at the end of a long day with enough space for their family to grow. Lauren was nervous for Robyn and Joel, but even more excited to help with the process. She takes her role as their Interior Designer very seriously, helping them to make decisions (everything from tile, flooring, paint colors, doors and hardware, to most recently the full kitchen cabinetry and design). We are beyond excited to be sharing our first of many posts about this special home and invite you to take this journey with us from construction and inspiration all the way to finished product. The kitchen is the project that is conceptually the most complete, thus we felt it was a great place to start. As you can see, it was a very old kitchen with little appeal. The colors were drab, the cabinetry outdated, and the flooring tile was nothing special. Robyn and Joel love a modern aesthetic with pops of bright colors and knew they could give this kitchen a whole new look. To begin with, we decided to extend the kitchen into the existing pantry / laundry room to give it more space and a more open feel. Once the ceiling was removed, it was obvious that raising the ceiling in this part of the house was a must. There was so much unused space up there it would have been a shame to not take advantage of it and give the room some height. 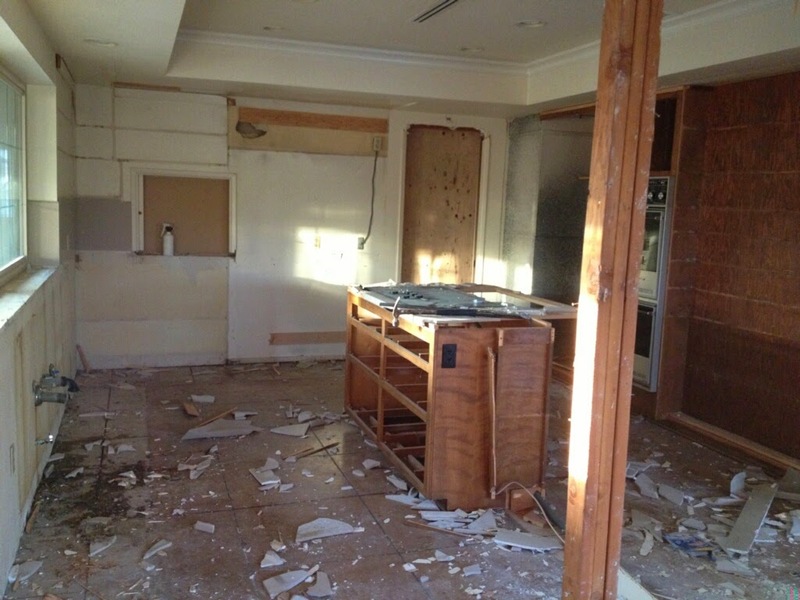 Everything else in the existing space was demolished giving Robyn and Joel a brand new clean slate. We decided to go with an all gray and white color story in the kitchen in order to keep it simple and create a timeless space. This room sets the tone for the rest of the house. It is centrally located and we know it will play an integral part in their daily life. Using pops of color in the backsplash and accessories / lighting gives the room a touch of excitement and stays true to this couple’s love for color. This is the inspiration board we created to show the overall look we are going for in this space, and as we are almost finished with the selection process for materials in this room, we are proud to say it is a great representation of what the finished product will look like. One of the most important decisions made thus far in the kitchen (or arguably the most important), was to go with Leicht for the cabinetry design. 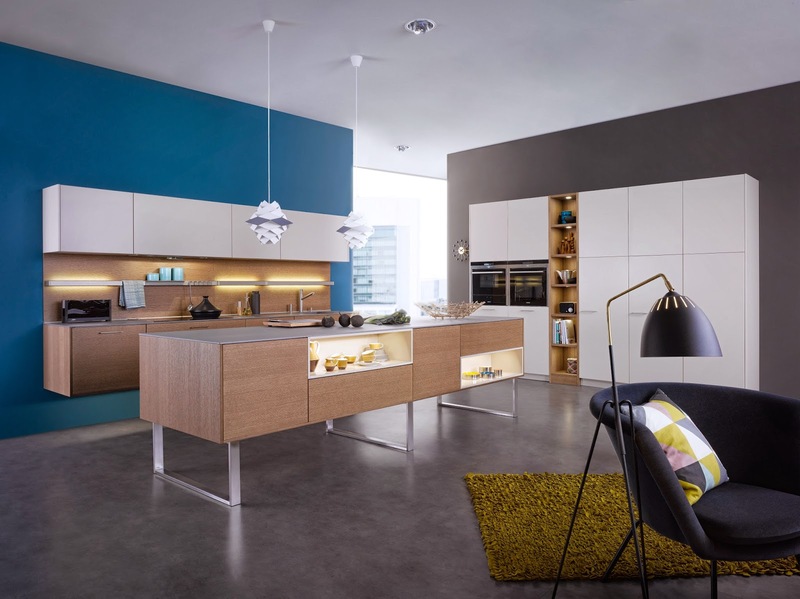 We knew if we wanted a super modern look we would need to go with a European company, and Leicht had everything we were looking for. Lauren took her in-laws to the brand new Leicht showroom in Beverly Hills and they were blown away. They selected a high gloss white finished cabinet with integrated pulls to give their kitchen that clean, crisp look. 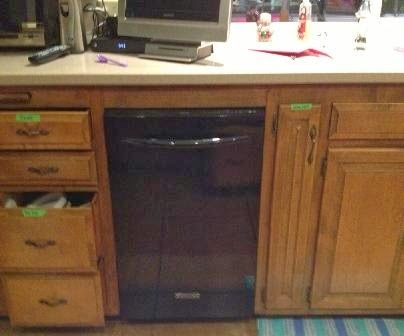 They decided to use integrated panels on the refrigerator and dishwasher as well and even included a few fun elements such as drawer dividers and spice canisters. Like we said, we are so excited to be sharing this process with you and can’t wait to reveal more of Robyn and Joel’s modern dream house design in future posts. This is one of the most fun projects Lauren has worked on to date because not only does she know the clients personally and how they live, but will have the luxury to enjoy this home for many years as well. At least once a week we make it a point to cook a meal together. This is a way for us to spend time with each other while creating something new to keep us (and Lauren’s husband) happy. While we feel like it is easy to continue perfecting our favorite recipes (like this or this), we love to try new things. With today being St. Patrick’s Day, we were on the lookout for special green recipes to help us celebrate. Although there are many adorable St. Patty’s Day treats we could have made (like these seen on our previous post), we decided to go on a more healthy route and do something that was a little unexpected. While on another one of our usual weekly rituals, a walk through the Brentwood Farmer’s Market, we were inspired by all of the fresh, green options. Why not support the local farmers and use St. Patrick’s Day as an excuse to “go green”? Lauren’s husband, Scott is a really good smoothie maker! So although we take the credit for finding this recipe and gathering all of the ingredients, the fact that it turned out delicious in the end is all because of Scott. 1. Mix 3 medium bananas, 2-3 cups frozen mango, 4 cups chopped kale, 1 lemon (peeled), and two cups water (Scott added a touch of honey as well) in a high-powered blender. 2. Blend until smooth and enjoy. This is a concoction we came up with ourselves, as we love the idea of an English muffin topped with cheese and eggs, but wanted to indulge in a healthier alternative. 2. If you are not a fan of rice cakes, this works just as well in a whole wheat tortilla (it just doesn’t have the crunch). At least once a week, we continue to try and find quick ways to create delicious and healthy meals. These brunch recipes met all of our criteria and left us (and our dad and brother who were visiting) well fed. We truly love to cook Side by Side (when we have the time) and hope to share many more recipes that we create “on the fly” with all of you in the future. Today, we want to challenge our readers to use this day to “go green”. Wishing everyone a Happy St. Patrick’s Day!